The fu, or rhyme-prose, is a major poetic form in Chinese literature, most popular between the 2nd century b.c. and 6th century a.d. Unlike what is usually considered Chinese poetry, it is a hybrid of prose and rhymed verse, more expansive than the condensed lyrics, verging on what might be called Whitmanesque. The thirteen long poems included here are descriptions of and meditations on such subjects as mountains and abandoned cities, the sea and the wind, owls and goddesses, partings and the idle life. Burton Watson is universally considered the foremost English-language translator of classical Chinese and Japanese literature for the past five decades. 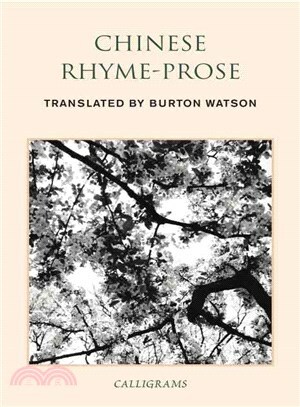 Gary Snyder calls him a "great and graceful scholar," and Robert Aitken has written that "Burton Watson is a superb translator because he knows what literature is." Here his seemingly effortless translations are accompanied by a comprehensive introduction to the development and characteristics of the fu form, as well as excerpts from contemporary commentary on the genre. A path-breaking study of pre-modern Chinese literature and an essential volume for poetry readers, the book has been out of print for decades. For this edition, Lucas Klein has provided a preface that considers both the fu form and Watson’s extraordinary work as a whole. Burton Watson is the foremost English-language translator of classical Chinese and Japanese literature. Among his many books are individual translated volumes of the poets Tu Fu, Su Tung-p’o, Han Shan, Lu Yu, Po Chu‥-yi, Gensei, and Ryo¯kan; the philosophers Chuang Tzu, Confucius, Mencius, Mo Tzu, Hsu‥n Tzu, and Han Fei Tzu; the historian Ssu-ma Ch’ien; and Buddhist texts such as The Lotus Sutra and The Vimalakirti Sutra. He is the editor and translator of The Columbia Book of Chinese Poetry and, with Hiroaki Sato, of a prolific anthology of Japanese poetry, From the Country of Eight Islands. He received the Gold Medal Award presented by the Translation Center at Columbia University in 1979 and the PEN Translation Prize twice, in 1981 and 1995. He lives in Japan. Lucas Klein’s translations include Notes on the Mosquito: Selected Poems by Xi Chuan, which won the Lucien Stryk Asian Translation Prize from the American Literary Translators Association. He lives in Hong Kong.